When V8 Speed & Resto Shop and V8TV Productions, Inc. in Red Bud had the opportunity to expand its classic and muscle car restoration shop into the building next door, it reached out to the Illinois Small Business Development Center (SBDC) for the Metro East at Southern Illinois University Edwardsville for guidance and resources. 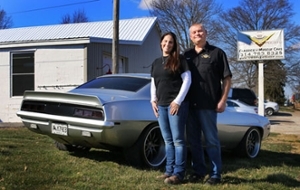 V8 Speed & Resto Shop and V8TV Productions owners Kevin and Kelle Oeste needed assistance to expand their business, and they trusted the SBDC. The Oestes have been working with SBDC Director Jo Ann (DiMaggio) May since late 2018. She has provided business plan reviews and feedback, financial guidance, and referrals. She was able to help frame what they needed to achieve prior to their expansion. May ensured the Oestes understood the commercial lending process and that documents required a smooth process for approval. May worked with Kelle Oeste on the financial projections and other required paperwork. May and Kevin Oeste worked on the business and marketing plans together. May also provided needed industry market research. The company started recording its TV and web show V8TV in a barn. They focused on muscle cars, tips, techniques and a wide variety of other topics. Based on customer inquiries and feedback, it rapidly grew into something much more than they anticipated. As an extension of the TV show, they created a restoration and performance shop for hot rods and other services, now known as V8 Speed & Resto Shop. Although located in a small town, V8 Speed & Resto Shop has worked with customers on a global level, and has been featured in numerous national magazines and events. With the expansion, V8 is eager to provide enhanced services and continue its intimate relationship with both current and potential customers. The Oestes are motivated to optimize the new space and resources to grow their staff, and open up a wider scope of projects. They are thankful to be able to expand the Resto Shop and improve the work quality for customers. V8TV is available nationally on The Action Network, TUFF-TV and REV’n TV, as well as online via YouTube or V8speedshop.com. You can also find them on Facebook and Twitter. Contact V8TV & Speed Shop at 314-783-8325 or visit the shop at 817 S. Main Street in Red Bud. The Illinois SBDC for the Metro East assists start-up ventures like V8 Speed & Resto Shop and V8TV Productions, Inc. as well as existing businesses headquartered in the nine-county region of Calhoun, Jersey, Madison, Bond, Clinton, St. Clair, Washington, Monroe and Randolph. It is funded in part through a cooperative agreement with the U.S. Small Business Administration, Illinois Department of Commerce and Economic Opportunity, and SIUE as a service to Illinois small businesses. Photo (L-R): V8 Speed & Resto Shop and V8TV Productions owners Kelle and Kevin Oeste.